How many times have you dashed out of the house and realized your cell phone battery was about to die? Who hasn’t frantically searched for a cell phone USB charger at work or even a party? Yep, we’re all guilty. The humble lithium ion cell phone battery is pretty much the bane of existence for the modern mobile world, and it hasn’t gotten all that much better despite the best efforts of many companies and people. There are a growing amount of startups and big companies out there that are focused on using science, chemistry, and nanotechnology to create new types of batteries that can be used in laptops and cell phones, as well as electric cars. But the reality is that science-based battery innovation tends to take a really long time to commercialize, and can be really expensive to develop. Electric car maker Tesla (s TSLA) knew this early on, which is why it uses thousands of small-form lithium ion batteries in its cars purchased from Japanese giant Panasonic. But in the face of the looming roadblocks for the progress of the everyday lithium ion battery, smart software has emerged as a novel option. And we’re not talking about the basic power management software on your cell phone. 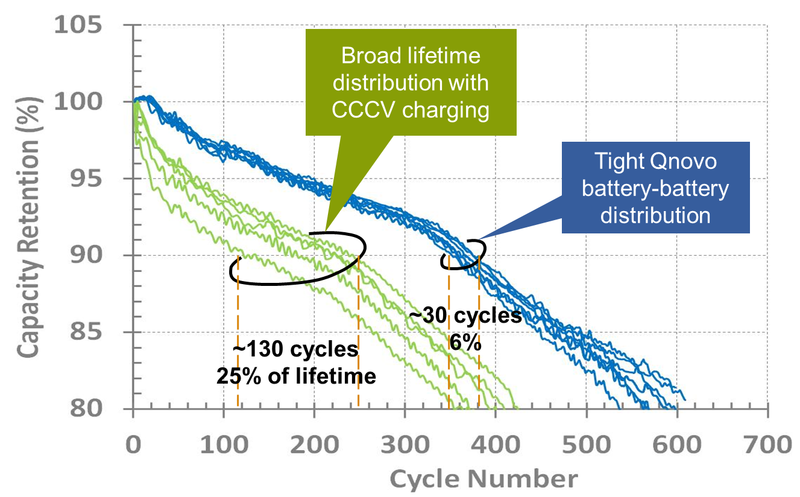 To meet this battery performance challenge, a promising startup called Qnovo has just emerged from stealth after four years in development with its own brand of software and silicon that taps into battery chemistry and makes batteries, well, better. I had the opportunity to speak to the founders and visit their labs for the first time this week. On Monday afternoon I pulled my City CarShare Prius into the parking lot of a bland office park that looks like it could be anywhere in the tech startup-filled south or southeast sections of the Bay Area of California. This one is just off the 880 freeway in Newark, about 5 miles (a ten minute drive) from Tesla’s Fremont factory. As I parked the car, the dashboard showed off the very rudimentary Prius animation of how much energy had been going into and out of the car’s battery (not all that much). At the same time the cell phone in my pocket started running dangerously low of battery power, considering I was about to use it to record an interview and also take photos. Inside, in the back of the building shared with a couple other startups, sat the 20-person Qnovo team among rows and rows of battery testing and analytics equipment. 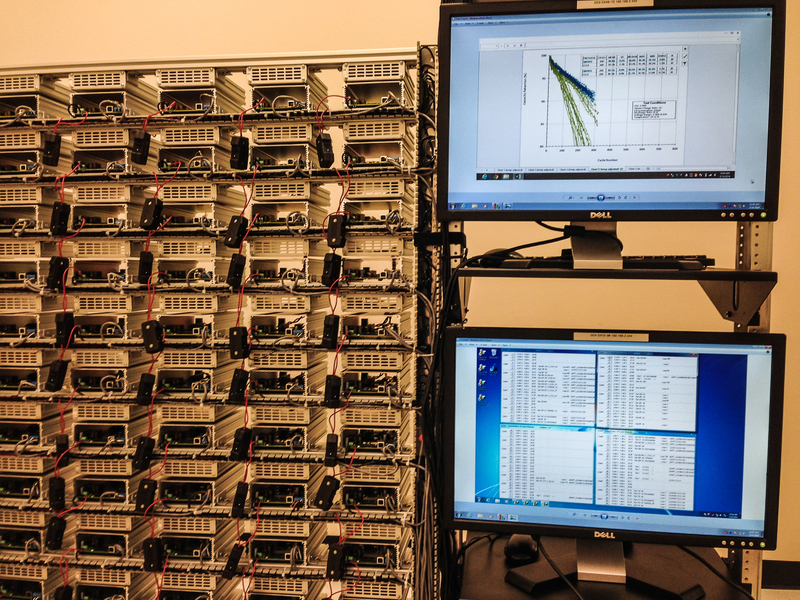 Over the past four years, the custom-built equipment and the team have tested close to 200,000 battery cycles (one cycle is a charge and discharge of a battery), which has created about 7 terabytes of battery data. That makes them one of the world’s experts, outside of Tesla and a handful of others, in the new world of battery performance data and management. A custom-made battery testing bank in the labs of Qnovo. Onovo was founded in 2010 by a three-person team of entrepreneurs led by CEO Nadim Maluf, who was formerly an entrepreneur-in-residence at US Venture Partners. He spent over a decade as a consulting electrical engineering professor at Stanford, and is also a long-time Valley business executive. Fred Berkowitz is VP of product engineering, and he joined Maluf early on after being the lead systems engineer on the Macbook for Apple. VP of Technology Dania Ghantous, another founding member, has been working on battery technology for the past two decades. Maluf called the original idea to extract more performance out of a standard lithium ion battery with software and silicon “a little wacky” — particularly back in 2009, while he was at USVP. At the time, venture capitalists were starting to realize that energy manufacturing and materials startups were really hard (and difficult to make money), and they were just starting to move away from funding energy companies. Maluf wanted to do something in batteries, but using computing, not materials or manufacturing, and with a much smaller amount of money raised than some of the very capital-intensive battery companies at the time like A123 Systems. By 2010, Maluf said, the three founders were able to establish that by using just software and silicon they could boost the performance of a cell phone battery considerably — or enough, they think, to create valuable products for cell phone makers, carriers, and even some day maybe directly for regular consumers. Maluf attributed the early critical thinking needed to crack the code to the electrical engineering talent and the battery chemistry talent of his co-founders coming together in an unusual way. “Battery chemists and engineers working together is quite novel,” said Maluf, explaining that it might seem like large Asian battery giants would have these divisions working in tandem, but within conglomerates they’re very separately run. As proof of just how rare this pairing is, while we were walking around the battery testing site Berkowitz started explaining to me how they had to invent the equivalent of an entirely new battery analytics language that’s a bit like Java. Qnovo has created two products: one part software, the other part silicon. Over the years the startup has evolved to become more of a software and systems developer, and has figured out that it can work with chip companies to modify their chips to work with Qnovo software. Qnovo’s silicon controller sits between the battery and the main applications processor on the phone, and it measures the battery’s parameters, including current, voltage, and temperature. The smart software applies its own models and algorithms to that data, and uses it to make decisions about charging the battery on the fly. The data and software essentially illuminates to the controller the state of the battery and its chemistry in real time, and the controller optimizes how the battery charges, and can also charge it as fast as possible but while keeping the battery healthy. To really get how this works, you have to picture how lithium-ion batteries charge and know a little something about the chemistry. 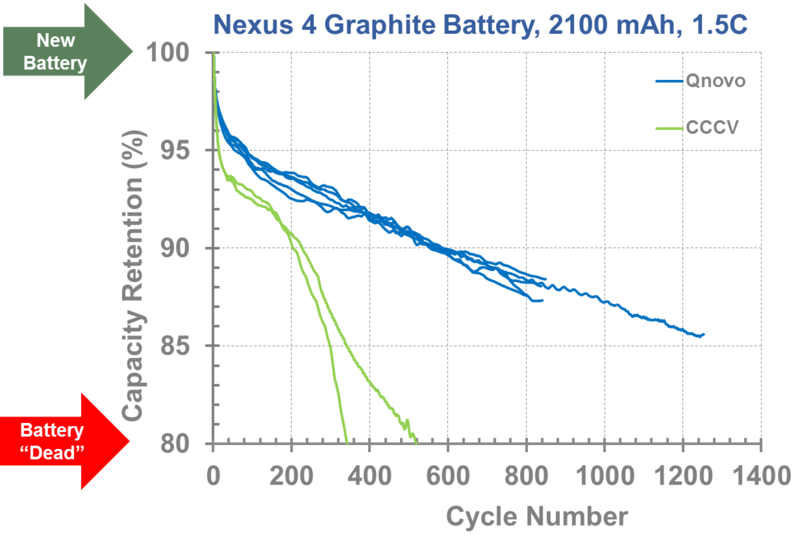 Lithium-ion batteries have a positive electrode, which is made up of a lithium-metal oxide (like lithium cobalt oxide) and a negative electrode, which is generally made up of graphite. When the battery charges, the lithium ions move from the positive side to the negative side and back again, usually through a thin, porous separator and a substance called an electrolyte, which tends to be made of organic solvents and lithium-based salts. Still with me? As the battery charges and discharges repeatedly (lithium ions continuously being pushed back and forth between the two sides through the separator and the electrolyte) there are a bunch of unwanted little chemical reactions that can occur that lead to the battery degrading, corroding, and eventually breaking down over time. Eventually — often times after about two years — lithium-ion batteries no longer will hold the charge because of this degradation. If you’ve ever had a laptop battery swiftly stop working for you, that is why. The regular lithium-ion batteries used in many cell phones are supposed to last at least two years — at least that’s what many phone makers and wireless carriers promise to their customers. But the dirty secret of the battery industry is that some of the batteries in cell phones only last a year before they go kaput — both Qnovo and the carriers are quietly discovering this after rigorously independently testing batteries. “When we started out we didn’t realize the battery vendors were hiding a lot of dirt,” Maluf said. Qnovo’s silicon and software combination can “adaptively” charge the battery by using algorithms to tell how well the battery is operating (down into the chemistry itself) and using the controller to ramp the charge up or down (speed it up or slow it down) appropriately in real time. The system basically optimizes the battery, delivering both a longer life (more cycles, more months of use), as well as a faster rate of charging, particularly when a low battery is first plugged in. 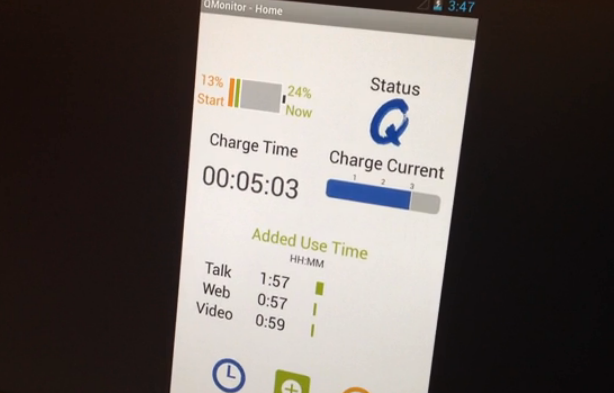 The fast-charging feature is what Qnovo considers the killer app. A Qnovo-enabled phone (with both silicon and software) can charge a battery from almost dead to 80 percent in 30 minutes. Without Qnovo, a cell phone could take two or even three hours to recharge that much, Maluf said. Smaller amounts of charge time could be even more important: 15 minutes of charge time with Qnovo could deliver 6 hours of use time. Qnovo also is creating a software-only product, which gets about half of that charging performance. You might be thinking, well, you can also just speed up the charge time by ramping up the amount of amps into the phone. Yes, you could do that but if you ramp up the charging amps into the phone too much, for too long, it will quickly kill the battery life. Getting phone companies to adopt components is infamously difficult. Maluf told me that it costs “somewhere under a $1” per phone for the added silicon, which needs to be embedded in the phone. Cost-conscious handset makers will have to make the decision if the fast charging, or other features, adds enough value to justify the cost. The software-only option, of course, is less expensive to install, but also offers less value. Maluf would love to find some way to make the product an app — “maybe some day, that’s the dream” — but that it’s been tricky figuring out how to make a consumer-focused product. The first thing is to convince its first manufacturing customers to agree to work together in getting the silicon and software in the phones. Qnovo is “in advanced talks” with all of the major handset makers, Maluf said, though he declined to name names. Qnovo raised a seed round early on from US Venture Partners and Rockport Capital Partners, and a Series A round a year or two in. In total Qnovo has raised just shy of $15 million, Maluf said. That’s a fraction of the amount that some of the big venture-backed materials and manufacturing battery players have raised. And that was the idea, really. The underlying notion is to use software intelligence to move the burden of progress off of battery manufacturing and materials to make the humble lithium ion battery better, Maluf said. Beyond the immediate business model of fast charging, that type of intelligence could do other things, too, like add performance and quality to low quality, cheap Chinese batteries. Qnovo is an example of how cleantech startup and VC-investing could be done: capital-light, small teams, bringing together well-known but siloed disciplines, and using advancements in algorithms and computing to make products. That would seem like a better for both the Valley’s VCs and entrepreneurs. Qnovo is just getting started, so we’ll see how well the company commercializes — “soon,” Maluf said — but it seems to have made some smart early moves. If it can convince the world that everyone needs fast charging, then it could be well on its way. This “new” tech sounds very similar to what Tesla has been doing except for the added silicon. How is this more sophisticated than the Tesla system? @Slayerwulfe, Katie is being polite. Your bad spelling and grammar show you have no understanding of her profession, writing, but she didn’t call that out in front of an audience. If only you had the same courtesy (and bothered to read the full article). @slayerwulfe, have no idea what this comment means. if you read the article, you would know that the silicon is not for the chemistry in the battery itself, but for a controller in the phone.